Clean your hands and your bike with just one wipe. Grease Monkey Wipes, the premier individually packaged degreasing wipes for cyclists, provide a convenient solution to cleaning your greasy hands as well as your bike chain and other drivetrain components. 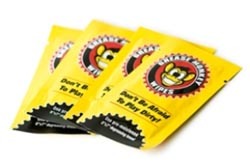 Grease Monkey Wipes were originally designed for cyclists to clean their hands after a mid-ride repair. Now cyclists are using them to clean their bikes too. "When we introduced Grease Monkey Wipes we envisioned them as a portable solution to remove grease from your hands after changing a flat tire, putting back on a dropped chain, or dealing with other mechanical issues associated with riding," says Tim Stansbury, owner of Grease Monkey Wipes. "Now our customers are sharing additional ways they use the wipes, such as easily cleaning their bike chains. They like the fact that they can use a single, pre-moistened wipe to quickly clean the chain, whether at home or at an event." Designed by cyclists for cyclists, Grease Monkey Wipes are individually packaged degreasing wipes. Each durable 2.5" x 4" pouch contains an 8" x 7" nontoxic, pre-moistened wipe that utilizes a natural, citrus-based formula to handle heavy duty cleaning, including grease and grime. Grease Monkey Wipes are conveniently sized to be kept in a saddle bag, bento box, jersey pocket, post-race bag, or toolbox. Grease Monkey Wipes have a MSRP of $1.00 and can be purchased online at www.greasemonkeywipes.com and at bicycle retailers throughout North America. Interested in carrying Grease Monkey Wipes? The company is in the process of expanding its retailer and distributor network and welcomes new dealer inquiries. Please contact Tim Stansbury at tim@greasemonkeywipes.com for more information. There is a low minimum order and prices are keystone. Grease Monkey Wipes is located in Austin, TX and strives to provide unique products for cycling and triathlon enthusiasts. The company is committed to offering customers eco-friendly products that are made in the United States. For more information visit the company's website at www.greasemonkeywipes.com.